This page will walk through Spring Boot Servlet mapping example. Servlet mapping can be achieved either by using ServletRegistrationBean or by using @ServletComponentScan annotation in Spring Boot. ServletRegistrationBean registers Servlet as Spring bean. @ServletComponentScan scans Servlet annotated with @WebServlet. The annotation @ServletComponentScan works only using embedded server in Spring Boot. Here on this page we will create two Servlets and one Spring Controller class. We will provide examples to use Servlets using ServletRegistrationBean as well as @ServletComponentScan step by step. ServletRegistrationBean is used to register Servlets in Servlet 3.0 + container. We need to create a bean of ServletRegistrationBean in our JavaConfig. Find some methods of ServletRegistrationBean used to configure a Servlet. setServlet(): Sets the servlet to be registered. addUrlMappings(): Add URL mappings for the Servlet. setLoadOnStartup: Sets priority to load Servlet on startup. 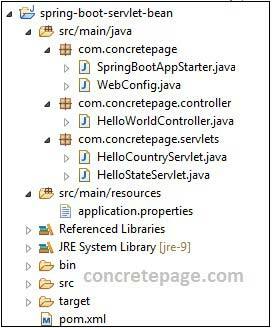 Suppose we have two Servlets as HelloCountryServlet and HelloStateServlet then we will register them with Spring Boot using ServletRegistrationBean as following. For every Servlet we create a ServletRegistrationBean bean. The Servlets HelloCountryServlet and HelloStateServlet can be accessed using URL /country and /state respectively. Find the Servlets used in our example. Find the controller used in our example. Find the Main class to start the application. @ServletComponentScan in Spring Boot will scan Servlets annotated with @WebServlet, Filters annotated with @WebFilter and Listeners annotated with @WebListener. The annotation @ServletComponentScan is used on JavaConfig at class level. @ServletComponentScan scans Servlets, Filters and Listeners only using an embedded web server. Find the Servlets annotated with @WebServlet. We can use @ServletComponentScan as following. We can run our Spring Boot application in following ways. 1. Using Maven Command: Download the project source code. Go to the root folder of the project using command prompt and run the command. Tomcat server will be started. 2. Using Eclipse: Download the project source code using the download link given at the end of article. Import the project into eclipse. Using command prompt, go to the root folder of the project and run. and then refresh the project in eclipse. Run Main class SpringBootAppStarter by clicking Run as -> Java Application. Tomcat server will be started. 3. Using Executable JAR: Using command prompt, go to the root folder of the project and run the command. Now we are ready to test the application. To run HelloCountryServlet, find the URL. To run HelloStateServlet, find the URL. To run HelloWorldController method, find the URL.